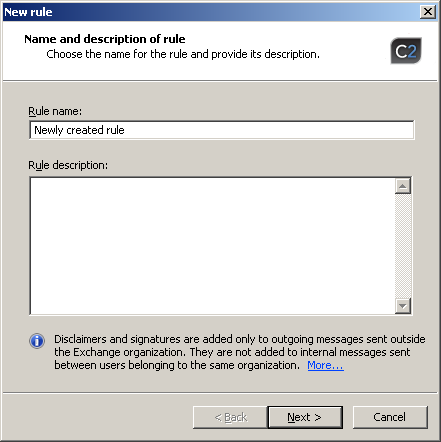 Below you will find a concise description of the steps you need to take to create a new rule adding footers to messages sent via Exchange Server. 1. 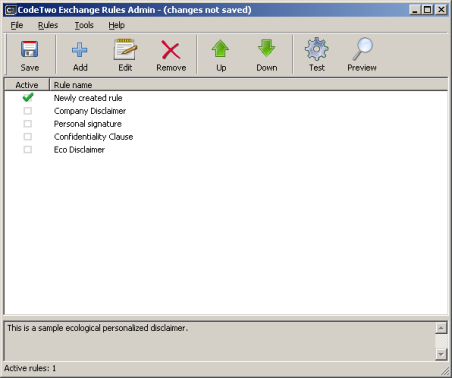 Run CodeTwo Exchange Rules 2003. 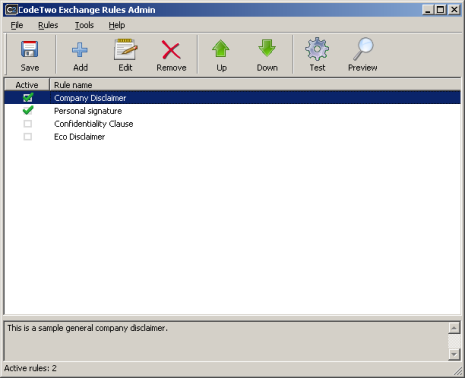 A screen containing a list of all existing rules will display. Click Add (CTRL + A) to activate a new rule wizard. 2. The new rule wizard will guide you through the process of creating a new rule. 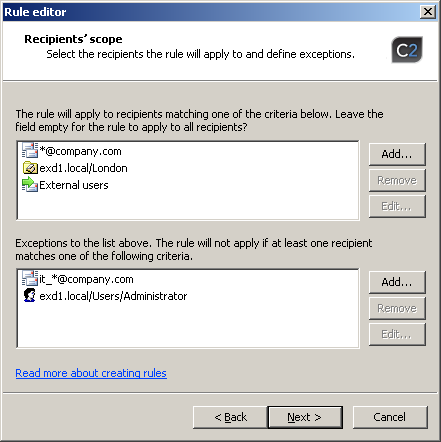 Provide the name of the rule and optionally its description in Name and description of rule dialog box. If you leave the field empty, the rule will apply to all senders. The lower field is used to add exceptions to the senders' scope. 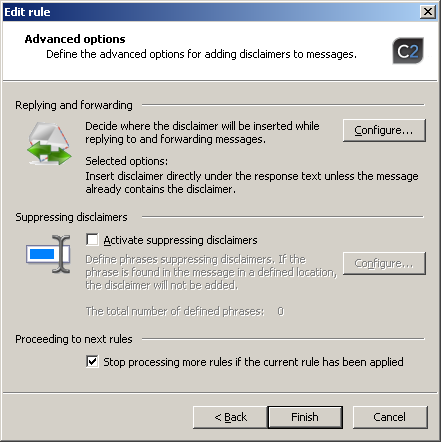 In this dialog box you specify the users who the rule will apply to. 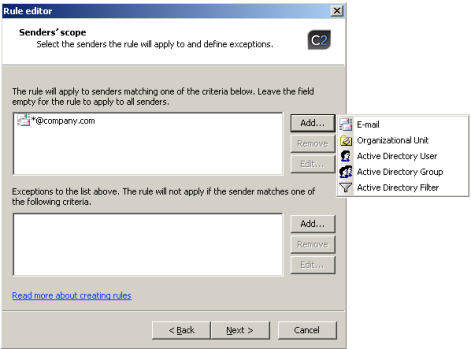 You can use ranges of SMTP addresses, as well as Active Directory objects (distribution lists, organizational units, user objects, objects with specific attributes). Also, you can decide whether the rule will apply for external recipients or internal. More about defining the recipients' scope. If you leave the field empty, the rule will apply to all recipients. You can provide a path to an already existing footer or create a new one with the help of the built-in visual editor. Click Edit disclaimer to open the editor. 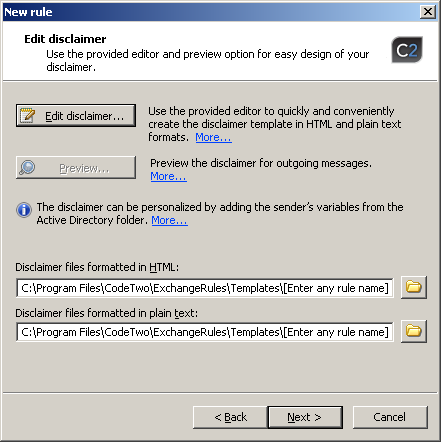 With the easy-to-use signature editor you can quickly create a new rule containing various HTML elements, including images. 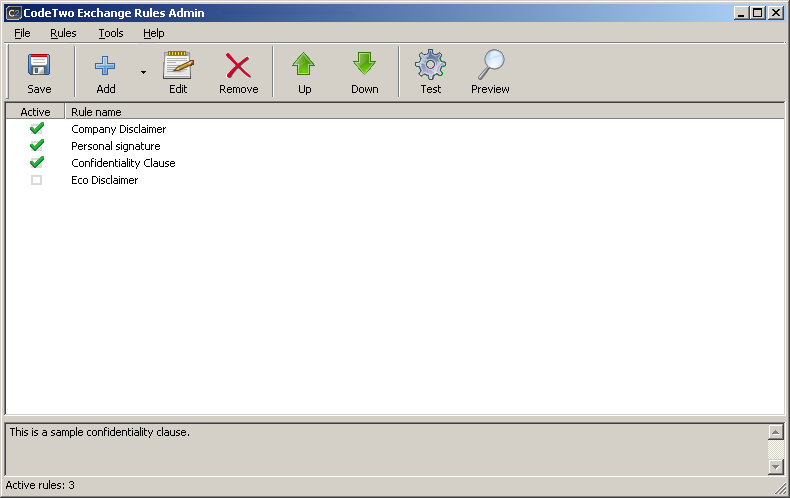 While creating personalized signatures, you can use placeholders linked to Active Directory database; the AD variables will be replaced with data while messages are processed by the mail server. You should create a HTML footer template to be used with HTML-formatted and RTF messages, as well as a plain text template, which is going to be used with messages in composed in plain text. 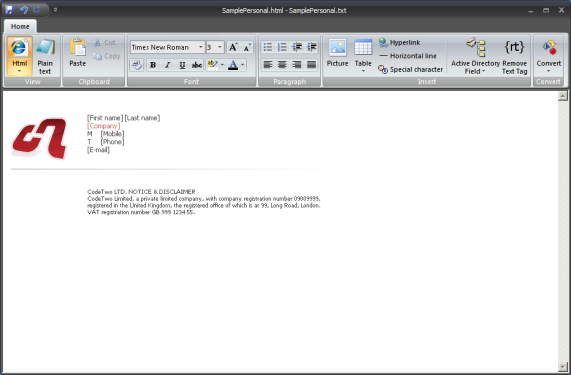 To create a plain text template click Plain Text and enter its text. If you have already created an HTML footer beforehand, click Convert button from the top menu and choose Convert HTML to plain text. The template will be converted to plain text based on HTML content in an instant. Rules are processed in the order in which they appear in the list in the main CodeTwo Exchange Rules 2003 screen from the top one to the one at the bottom. If you want to change the order of rules, use Up and Down buttons. 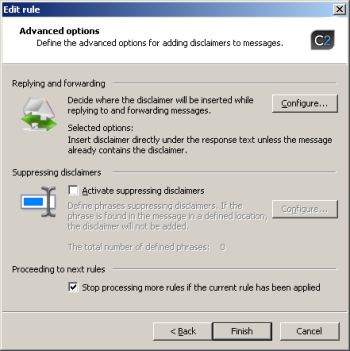 You can deactivate any rule by unchecking its checkbox in the Active column. Remember that all changes will take effect only when you have saved them by clicking Save in the toolbar.